e-scential beauty's corporate gift program brings personal attention to your gift giving requirements. You can choose from a wide assortment of handsomely wrapped gift selections appropriate for all occassions. Alternately you can work with a corporate gift specialist to assist you in choosing specific selections for a customized gift program. Corporate pricing is available to e-scential beauty corporate customers wishing to benefit from our exclusive discount pricing structure. Please use this link to contact a corporate gift specialist. 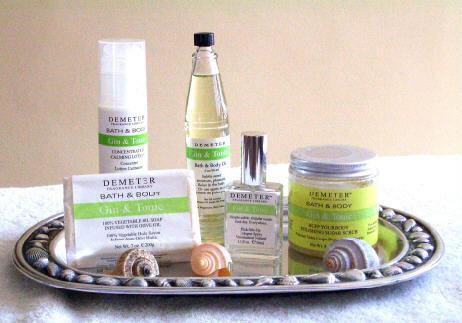 Gift Selection DEM 1: Demeter gift selection including Italian Vegetable Oil Soap, Concentrated Calming Lotion, Bath and Massage Oil, Sugar Scrub, and 1 oz. Cologne Spray. 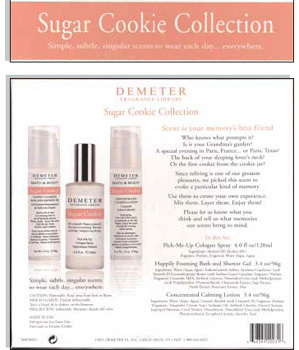 This selection is available in the following scents: Gin & Tonic, Angel Food, Orange Cremecicle. $65.00 for the set* Set does not include tray or shells. This set comes attractively wrapped in a gift box and ribbon. When purchased in multiple quantites through our corporate gift program $40.00 each. Larger discounts are availble for greater quantities. Please contact a corporate gift specialist to discuss your needs.